With the situation in the Middle East seemingly spinning out of control, many political observers are left wondering what it all means. The war in Syria has been at the forefront of the news since 2011, and rightly so, as Syria has become the epicenter of a larger regional conflict, particularly with the ascendance of ISIS in the last year. Undoubtedly, the mainstream acceptance of the ISIS threat has changed the strategic calculus vis-à-vis Syria, as the US prepares to launch yet another open-ended war, ostensibly to defeat it. And, while many in the West are willing to buy the ISIS narrative and pretext for war, they do so with little understanding or recognition of the larger geopolitical contours of this conflict. Essentially, almost everyone ignores the fact that ISIS and Syria-Iraq is only one theater of conflict in the broader regional war being waged by the US-NATO-GCC-Israel axis. Also of vital importance is an understanding of the proxy war against Iran (and all Shia in the region), being fomented by the very same terror and finance networks that have spread the ISIS disease in Syria. In attempting to unravel the complex web of relations between the terror groups operating throughout the region, important commonalities begin to emerge. Not only are many of these groups directly or tangentially related to each other, their shadowy connections to western intelligence bring into stark relief an intricate mosaic of terror that is part of a broader strategy of sectarianism designed to destroy the “Axis of Resistance” which unites Iran, Syria, and Hezbollah. In so doing, these terror groups and their patrons hope to internationalize the war in Syria, and its destructive consequences. In order to understand how these seemingly disparate groups fit into the regional destabilization, one must first recognize how they are connected both in terms of ideology and shared relationships. On the one hand you have the well known terror outfits operating in the Syria-Iraq theater of this conflict. These would include the ubiquitous ISIS, along with its Al Qaeda-affiliated ally Jabhat Al-Nusra. However, often left out of the western narrative is the fact that the so called “moderate rebels,” such as the Al Farouq Brigade and other similar groups affiliated with the “Free Syrian Army,” are also linked through various associations with a number of jihadi organizations in Syria and beyond. These alleged “moderates” have been documented as having committed a number of egregious war crimes including mutilation of their victims, and cross-border indiscriminate shelling. And these are the same “moderates” that the Obama Administration spent the last three years touting as allies, as groups worthy of US weapons, to say nothing of the recent revelations of cooperation with US air power. But of course US cooperation with these extremist elements is only the tip of the iceberg. A recent UN report further corroborated the allegations that Israeli military and/or Mossad is cooperating with, and likely helping to organize, the Jabhat al-Nusra organization in and around the Golan Heights. Such claims of course dovetail with the reports from Israeli media that militant extremists fighting the Syrian government have been treated in Israeli medical facilities. Naturally, these clandestine activities carried out by Israel should be combined with the overt attacks on Syria carried out by Tel Aviv, including recent airstrikes, which despite the inaction of the UN and international community, undeniably constitute a war crime. 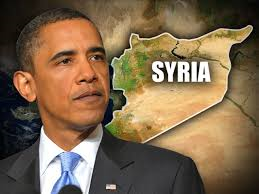 Beyond the US and Israel however, other key regional actors have taken part in the destabilization and war on Syria. Turkey has provided safe haven for terrorists streaming into Syria to wage war against the legally recognized government of President Assad. In cooperation with the CIA and other agencies, Turkey has worked diligently to foment civil war in Syria in hopes of toppling the Assad government, thereby allowing Ankara to elevate itself to a regional hegemon, or so the thinking of Erdogan and Davutoglu goes. Likewise, Jordan has provided training facilities for terrorists under the guidance and tutelage of “instructors” from the US, UK, and France. But why rehash all these well-documented aspects of the destabilization and war on Syria? Simple. In order to fully grasp the regional dimension and global implications of this conflict, one must place the Syria war in its broader geopolitical context, and understand it as one part of a broader war on the “Axis of Resistance.” For, while Hezbollah and certain Iranian elements have been involved in the fighting and logistical support in Syria, another insidious threat has emerged – a renewed terror war against Iran in its Sistan and Baluchestan province in the east. As the world’s attention has been understandably fixed upon the horrors of Syria, Iraq, and Libya, a new theater in the regional conflict has come to the forefront – Iran; specifically, Iran’s eastern Sistan and Baluchestan province, long a hotbed of separatism and anti-Shia terror, where a variety of terror groups have operated with the covert, and often overt, backing of western and Israeli intelligence agencies. an extremist Salafi group that has since its foundation claimed responsibility for a series of operations against Iran’s domestic security forces and Revolutionary Guards operating in Sistan and Balochistan province, including the detonation of mines [link added] against Revolutionary Guards vehicles and convoys, kidnapping of Iranian border guards and attacks against military bases… Jaish al-Adl is also opposed to the Iranian Government’s active support of the Syrian President Bashar al-Assad, which they regard as an attack on Sunni muslims…Jaish ul-Adl executes cross border operations between the border of Iran and Pakistan and is based in the Baluchistan province in Pakistan. It is important to note the centrality of Iran’s support for Syria and the Syrian Arab Army (and of course Hezbollah) in the ideological framework of a group like Jaish al-Adl. Essentially, this terror group sees their war against the Iranian government as an adjunct of the war against Assad and Syria – a new front in a larger war. Of course, the sectarian aspect should not be diminished as this group, like its many terrorist cousins, makes no distinction between political and religious/sectarian divisions. A war on Iran is a war on Shia, and both are just, both are legitimate. Like its terrorist cousin Jaish al-Adl, Ansar al-Furqan has claimed responsibility for a number of attacks against the Iranian Government, including a May 2014 IED attack on a freight train belonging to government forces. While such attacks may not make a major splash in terms of international attention, they undoubtedly send a message heard loud and clear in Tehran: these terrorists and their sponsors will stop at nothing to destroy the Islamic Republic of Iran. Two inescapable facts immediately come to the fore when examining these groups. On the one hand, they are Sunni extremists whose ultimate goal is the destruction of the Iranian state and all vestiges of Shia dominance, political, military or otherwise. On the other hand, these groups see their war against Iran as part and parcel of the terror wars on Syria and Iraq. And then of course there’s Jundallah, the notorious terror organization lead for decades by the Rigi family. Anyone with even cursory knowledge of the group is undoubtedly aware of its long-standing ties to both US and Israeli intelligence. As Foreign Policy magazine reported in 2012, Israeli Mossad and US CIA operatives essentially competed with one another for control of the Jundallah network for years. This information of course directly links these agencies with the covert war against Iran going back years, to say nothing of the now well-known role of Israeli intelligence in everything from assassinations of Iranian scientists to the use of cyberweapons such as Stuxnet and Flame. These and other attacks by Israel and the US against Iranian interests constitute a major part of the dirty war against Iran – a war in which terror groups figure prominently. These and other groups, too numerous to name here, represent a part of the voluminous history of subversion against Iran. But why now? What is the ultimate strategy behind these seemingly disparate geopolitical machinations? To see the obvious strategic gambit by the US-NATO-GCC-Israel axis, one need only look at a map of the major conflicts mentioned above. Syria has been infiltrated by countless terrorist groups that have waged a brutal war against the Syrian government and people. They have used Turkey in the North, Jordan in the South, and to a lesser degree Lebanon and, indirectly, Israel in the West. Working in tandem with the ISIS forces originating in Iraq, Syria has been squeezed from all sides in hopes that military defeat and/or the internal collapse of the Syrian government would be enough to destroy the country. Naturally, this strategy has necessarily drawn Hezbollah into the war as it is allied with Syria and, for more practical reasons, cannot allow a defeated and broken Syria to come to fruition as Hezbollah would then be cut off from their allies in Iran. And so, Hezbollah and Syria have been forced to fight on no less than two fronts, fighting for the survival of the Resistance in the Levant. Simultaneously, the regional power Iran has made itself into a central player in the war in Syria, recognizing correctly that the war could prove disastrous to its own security and regional ambitions. However, Tehran cannot simply put all its energy into supporting and defending Syria and Hezbollah as it faces its own terror threat in the East. The groups seeking to topple the Iranian government may not be able to compete militarily with the Iranian Revolutionary Guards, but they can certainly create enough destabilization through terrorism to make it more difficult for Tehran to effectively aid in the fight in Syria. The US-NATO-GCC-Israel alliance has not needed to put its own boots on the ground to achieve its strategic objectives. Instead, it is relying on irregular warfare, proxy terror wars, and small-scale destabilizations to achieve by stealth what it cannot achieve with military might alone. But it remains paramount for all those interested in peace to make these connections, to understand the broad outlines of this vast covert war taking place. To see a war in Syria in isolation is to misunderstand its very nature. To see ISIS alone as the problem is to completely misread the essence of the conflict. This is a battle for regional hegemony, and in order to attain it, the Empire is employing every tool in the imperial toolkit, with terrorism being one of the most effective.